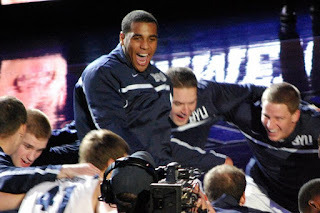 Brandon Davies makes me proud to be a Cougar. I watched the "Amazing" documentary DVD of last season this weekend and I really like how they handled the scene about Brandon's suspension. I remember when it all went down, it was pretty much the most terrible thing that could have ever happened (it would have only been worse if it had been Jimmer). But now I think it has turned into an amazing learning experience and example of integrity and honesty that has impacted everyone involved-- players and fans alike. The fact that Brandon is willing to talk about it on a documentary and say how grateful he is for all the support is just mind-blowing to me. If I went through all the ridicule he went through (and is still going through), I'd probably spend the rest of my life hiding in a hole. But he has shown remarkable growth, strength and resolve through it all. I think how the rest of the team talks about it shows a lot about Brandon's character. I especially like Jimmer's take on it. He says that when it all came out, he wasn't worried at all about the team or their chemistry or their ability to succeed-- he was just worried about "B" and what might happen to him and he wanted him to know that they all still love him and care about him, no matter what. It takes a special person to garner that kind of love and respect. 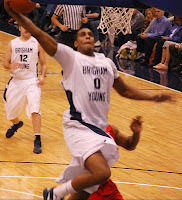 Compare what happened to Brandon Davies to what happened to Harvey Unga. I think Harvey was a great football player-- BYU's all-time leading rusher, a player I loved to cheer for. Then he was suspended at the end of his Junior season for an honor code violation (from what I gather, essentially the same violation as Brandon). But Harvey's suspension was very different than Brandon's. Harvey's infraction occurred at the beginning of football season in 2009. Yet he played football for BYU the entire season before admitting to it. He waited until he couldn't hide it any longer. On the other hand, Brandon Davies admitted to his violation at the worst possible time in the world. Right after BYU had risen to be the #3 team in the country and beaten San Diego State for the second time. Right before March Madness kicked in. The end result? They both re-applied to get back into BYU. Harvey didn't make it. Brandon did. I still think Harvey is a good person and a great player that came out of BYU. But he just doesn't seem to have the same dedication as Brandon does to making things right. In the end, Brandon just seems like an amazing person. He's got a great sense of humor and has shown an immense amount of integrity over the last year. Brandon and my friend Sariah. And oh yeah, I was there, too. We'll just pretend he didn't practically shove me out of the shot.